This week Reception focussed on pancakes and fire building. We discussed what was needed to create fire and reminded ourselves how to keep safe when we are cooking. The children are very good at remembering not to cross the fire circle and enjoyed mixing up the batter and cooking their pancakes in the skillet. We thought about where the different ingredients come from and the children were surprised to learn that the flour comes from grinding up wheat before it gets to the supermarket using the story Pancakes, Pancakes by Eric Carle. We had such a beautiful, crispy, Winter day with our Reception and Year 5 children this week. To keep us all warm, Reception children started their session with a game of Eagles Eyes to get them moving. They love hiding behind the trees, bug hotel and bushes and stealthily getting closer to the eagle nest without being caught. Next they went on a hunt for story stones to give them clues to this week’s story. They are getting good at exploring the site, so it was made extra hard with the stones being hidden higher up in the trees. We enjoyed telling the story of The Three Little Pigs with everyone getting involved, blowing down the houses. The children then worked in small teams to build new homes for the pigs using sticks, mud bricks and straw. We were so impressed with their teamwork skills and imagination. The pigs had very comfy houses by the end of the session! Year 5 had the challenge of putting up a tarp den today to start the session. Once their den was given the all clear (a good timber hitch knot and a taught ridge line), they had to hunt in the Forest School area for different coloured material to gather points for their team. It definitely kept them warm! After the game, we recapped on fire lighting using the fire steel. The children were much quicker to light the cotton wool than last year and felt proud of their achievements. Some of them chose to develop this to other methods of fire lighting, whittling and den building. Another great session! It has been very cold this week and we have enjoyed running around to keep warm, sitting round the fire and playing in the snow. It was great fun to explore and play in the snow with Reception children. In preparation for the Big Garden Birdwatch this weekend, we focussed on the different birds in our environment. We recapped on the features of birds and discussed some ways to tell them apart from each other. To keep the children warm, we had a team bird hunt, where the children had to find the different birds and match them up to their team's bingo board. This really helped the children to use their observational skills to distinguish between some similar birds. They then enjoyed a play in the snow, making snow angels, throwing snowballs and making snow sculptures. We took the rest of the session inside, where the children used their fine motor skills to create bird feeders using cheerios and pipe cleaners. We hope they will attract a variety of birds to their school and garden ready to count in the Big Garden Birdwatch. Year 5 absolutely love playing Secret Stone to warm themselves up. They are developing their team tactics each week and the game is getting more challenging and more fun. We then set them another knots team challenge of building the tallest free standing structure. They worked well and everyone got involved, taking on different roles within their teams. Following a discussion about the Big Garden Birdwatch and the birds that we would see in the area, some children had a go at weaving bird feeders using the jigs and willow. This is very challenging and so took a lot of patience, concentration and perseverance. What fantastic achievements! This week Reception children continued on their theme of storytelling. First we recapped on how to tie a ridge line using a rope and hung a tarp over it to make a theatre for our story. Some children used puppets to act out the story of Little Red Riding Hood, entertaining us all from behind the tarp. We used a song to introduce the reef knot to the children and they all had a go at using the knot to tie elastic on to a wolf mask that they made. We were very impressed with how every child had a go at this skill without giving up. Knots was the focus for Year 5 as well. We recapped on the reef knot, clove hitch and square lashing with the children, before they had a go at putting these skills to work, making a structure that would keep a team mate off the ground for 5 seconds. There was a great range of ideas and the children stated that they really enjoyed working with different children to complete this challenge. Some children chose to continue with their dens and structures, whilst others had a go at fire lighting with charcloth and grass. It took a lot of patience but was worth the effort when the fire started burning! This week saw us welcoming back our Reception class after the Christmas break and wishing them a happy new year. It was very cold yesterday, but it didn't stop the Reception children from being enthusiastic and embracing the activities we had available for them to explore. We started with a hunt for some story stones that gave the children clues about what the focus of the session would be. They worked together to determine that the story was Goldilocks and the Three Bears. All the children joined in and helped act out the story around the fire, before cooking and tasting some porridge just like the three bears. We played some games to warm up and then introduced the children to den building using ropes and a tarp. They have started to learn how to create a ridge line between two trees using 'Sammy the Snake' to tie a timber hitch knot. The children then worked together to peg out the corners of the tarp to create their own den. We were so impressed with the way they are beginning to work together in teams and think about their peers, sharing the jobs and roles. We will carry on giving them experiences to practice this new skill this half term. We were excitedly greeted in the afternoon by Year 5 who ran at us singing our Forest School song as they headed to base camp. They were quick to remember the songs, rules and routines that we introduced last year when they were in Year 4. This year, we hope to have more discussions about what impact Forest School is having on them as a person and invited them to reflect on their Forest School experience of last year and share what we were looking forward to working on this half term, whilst making friendship bracelets under our beautiful Hornbeam trees. We recapped on the personal skills that we focus on in Forest School and the children worked in teams to create land art to reflect on these. They worked well in teams and explained their creations to their peers showing developing confidence and ability to express themselves. An early hot chocolate was needed to warm us up and then the children had some time to explore. Some chose to begin extending their whittling skills and were introduced to the sheath knife. They worked carefully and created tent pegs. Other children helped build the fire and toast some marshmallows. Much needed on what was a very cold day! We had a great last session of the term with the children of Bourne Primary School. Reception children enjoyed a game of Elf Eyes to start our session yesterday. They love hiding amongst the trees and sneaking closer when Donna has her eyes closed. The children used wood cookies and drills to create snowmen to hang on the Christmas tree. They were very patient using the drills, even though they can be tricky and linked the wood cookies together with pipe cleaners. Continuing to work on their fine motor skills, the children made jingle bell sticks before having a bit of a sing song back at base camp. Year 5 had their last Forest School session for this academic year and it was a celebration of their achievements. The children reflected on their time at Forest School, finding their favourite place and standing there quietly. They thought about how their skills have developed since their last block of Forest School and it was interesting to hear their comments which ranged from making new friends, being more resilient and enjoying the outdoors more. 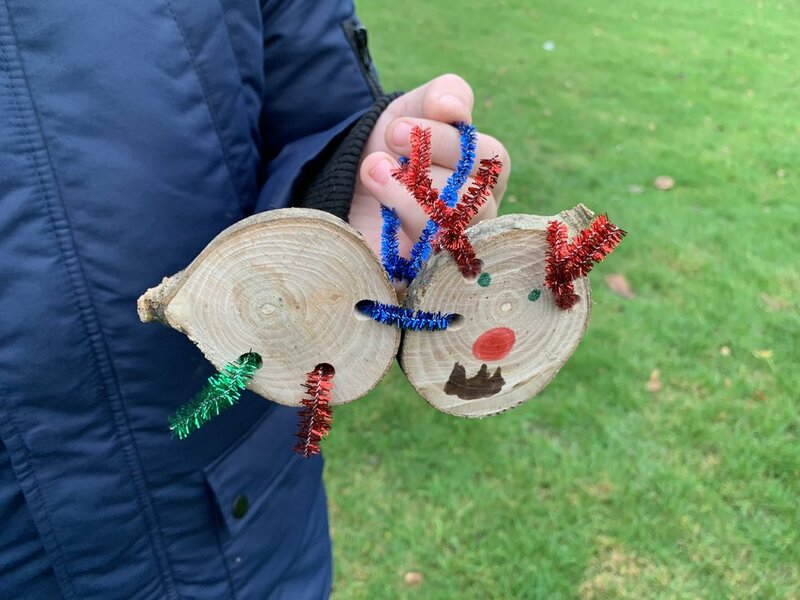 The children had time to choose how they wanted to spend their last session, making Christmas decorations by drilling wood cookies, whittling jingle sticks and den building. Well done on all that you have achieved this year! This week has been quite wet, but it has not stopped our school groups from getting out and enjoying themselves. Our Reception children came out well dressed for the weather conditions in their hats, scarves, gloves, wellies and waterproofs. After a game of Eagle Eyes to get ourselves warmed up, the children took part in a game of trust. Each child had to take it in turns to close their eyes and be led to a tree by their partner. They used their senses to get to know the trees shape, size and smell, before being led away. Once they opened their eyes, they had to find the tree that they got to know in the woods. The children were able to share how they felt about walking with their eyes closed and having their sense of sight taken away. With it being our penultimate session for the year, we decided to start to think a bit about the trees in Winter and Christmas, by sharing Stickman with the children. They made their own stickman using pipe cleaners to secure the sticks together. Although this was challenging to ensure that they were tight enough, the children are persevering and improving with the skill of twisting the wire to make it tight. They shared with their friends the names of their stick people and thought about the things they liked doing. Year 5 enjoyed a game of Capture the Flag again this week to keep themselves warm. They were able to improve on their teamwork skills in putting up their dens much more efficiently by taking more responsibility to help their team. Some more children had a chance to light a fire using charcloth and dried grass, whilst others had a go at whittling with the sheath knife. We were very impressed that some children are now developing their own ideas and using the knots that they have learnt to create swings and ladders independently. We look forward to welcoming the Year 5 parents for their last session next week. With Winter approaching, our Reception children this week started to focus on the preparations animals in the environment will be making for the cold season, particularly focussing on birds. Most of the leaves have now fallen which gave us a good view of the nests that have been built by the birds on site. The children were able to spot several nests with their partners and then created nests of their own out of materials they scavenged from the floor. To encourage birds to visit the area, the children made bird feeders by threading a pipe cleaner onto an ice cream cone before covering it in vegetable fat and seed and hanging it in a suitable tree. It took a lot of gentle hands and concentration to not break the cone! They are looking forward to seeing what birds visit over the week. In Year 5 the children are continuing to work on teamwork. It was cold out this week so we introduced a new game to keep them warm: Capture The Flag. The children worked in teams to peg out a tarp den which they tied their flag to. They had to think about team tactics in order to take other flags and get them back to their den without being caught or indeed losing their own flag. It involved lots of stealth! This week we developed the children's fire lighting skills. We recapped on the safe use of the fire steel and what is needed to make fire. The children learnt how to make a spark land on some charcloth before wrapping it up in some dried grass and using a gentle blowing technique, creating a fire of their own. It was great to see how determined they were. Well done Year 5! Great concentration was shown by some of Year 5’s who began developing their whittling skills by moving on to sheath knives. They worked hard to fashion a pointed end and a notch to make their very own tent pegs. Very useful for making the perfect den. This half term our Year 5 group are developing their confidence with knots and lashings. They have been learning the clove hitch, the reef knot and square lashing and have been putting them to good use each week with a new team challenge. So far they have made a structure to keep one of their team members off the ground for 5 seconds and this week they made the tallest free standing structure they could. We are proud to see how their teamwork skills, problem solving skills and confidence levels are developing each week as they complete the different challenges.